Being up to date with the latest updates in the digital marketing industry is not an easy mission. Many events are organized every year in Egypt in Digital Marketing and in related industries such as; Media, Marketing and Technology events indeed. Every marketer should attend these events as it effects on the digital marketing growth plus it grows the community that you should connect every day. Besides, attending events help you find new opportunities that you didn’t think about it before. 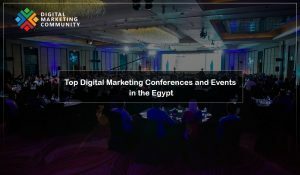 Here’s a bunch of the best Digital Marketing, Media, Marketing and Tech events and Conferences in Egypt during 2018, which should be added to every marketer’s calendar. This list includes the most successful, useful and popular events that focus on a wide range of topics from Social Media, to SEO, to content marketing, and much more in Marketing. The Marketing Kingdom Cairo is an annual event organized by PWorld, where 300+ marketing and social media experts come together to benchmark their strategies against the industry’s most forward-thinking initiatives and frameworks. This event is part of a series of annual editions in 14 different countries, as it considered to be one of the world’s most innovative events on marketing and social media. For the past 4 years, Creative Industry Summit (CIS) has established a reputation for its many firsts. Being the first to launch an annual summit dedicated to creativity in all walks of the creative industries. Ramadan is the season in which Egypt’s entire creative industry is put to the test. It is that one single month when creative minds can show off and really get to enjoy the fruits of their labor. Stay tuned for more details about the Ramadan Edition 2017: The FOURTH Ramadan Edition of Creative Industry Summit! In 2018, Narrative PR Summit celebrates its third edition as the official annual gathering that brings the country’s best narrators under one roof to participate in branding our nation. The region’s leading innovation and entrepreneurship summit is back for the 6th year in a row. Join thousands of founders, investors, CEOs, speakers, and supporters from all over the world for three sunny days of non-stop content, events, and activities. The 72-hour frenzy will include fierce pitch competitions, talks and workshops with global industry leaders, a showcase of MENA’s best startups, satellite events (party, anyone? ), networking opportunities, and so much more. It’s a first of its kind opportunity for every E-Commerce-related function to be present under one roof raising awareness about E-Commerce. The summit will introduce you to the wholesome E-Commerce experience and its inner workings from stepping into selling online and tailoring your business strategy to handling payments and logistics. Ahmed Emad – E-Commerce Business Lead in Middle East & Africa for Mondelēz International. Social Media Day is an annual global celebration that gather all Social Media Professionals and Geeks in Egypt for exchanging experiences and Social Media knowledge. Social Media Day Egypt is coming this year with a new sizzling edition as a retreat at El Gouna. It’s the first Social Media Retreat beach based event in Egypt for teams and startups including Social Media/Marketing workshops and Game-Based Business Skills workshops, Crossfit, Watersports, social and recreational activities.